US Internet provider Armstrong warns that persistent pirates can have their Internet access throttled. As a result, they may no longer have full control over their thermostats. Those who continue pirating after an obligatory copyright education may have their full service terminated. Since the early 2000’s copyright holders have been sending ISPs takedown notices, to alert account holders that someone’s been using their connection to share copyrighted material. The goal of these warnings is to deter people from sharing pirated material in the future. Internet providers are not legally obliged to forward the notices, but many do. What ISPs are required to do is implement a policy to deal with frequent offenders. Keeping pirates on board without taking any action can make the ISP liable, as Cox found out the hard way. While this case is currently on appeal, some ISPs have already put stringent measures in place. Take Armstrong Zoom Internet, for example, which has roughly a million subscribers in the Northeastern part of the U.S. Like many other ISPs it reserves the right to terminate repeat infringers, a policy which it doesn’t hide. Our attention was caught by a recent letter the company sent to one of its users. The ISP points out that it received multiple copyright infringement notices, urging the customer to stop, or else. “…please be advised that, if Armstrong receives additional notifications of infringement connected With your Zoom Internet Service, Armstrong will remove you from your current service level and place you at the lowest service level. While reduced Internet speeds are bad enough, there’s another scary prospect. 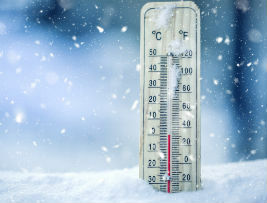 The reduced service level may also prevent subscribers from controlling their thermostat remotely. Not ideal during the winter. Accused pirates who want their full service restored, and regain control over their thermostats, have to answer some copyright questions and read an educational piece about copyright infringement. When they sign an agreement acknowledging that they have done so, full Internet access is restored. However, if more complaints come in later, the consequences will be more severe. 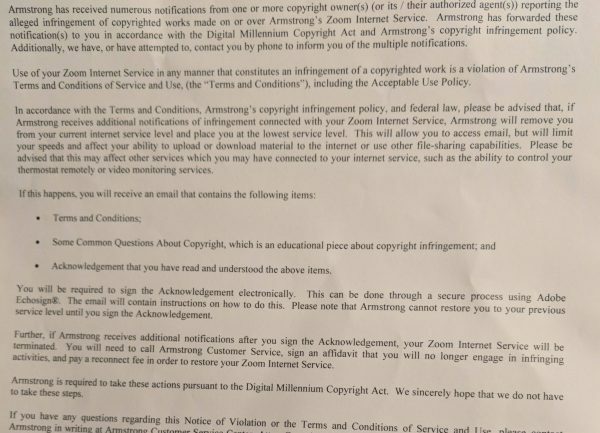 “…if Armstrong received additional notifications after you sign the Acknowledgement, your Zoom Internet Service will be terminated,” the provider writes. Getting back in after that is only possible after signing an affidavit, so under penalty of perjury, and by paying a fee. Only then they will regain full control over their thermostat again.